The Write@UNG workshop series has wrapped up its first year of workshops 2016-2017. This faculty development program stretches across five campuses and enriches scholarly productivity through a focus on research and writing skills. The Write@UNG workshops was facilitated by Dr. Michael Rifenburg, Department of English and a Center for Teaching, Learning, and Leadership (CTLL) Faculty Fellow for Scholarly Writing. The program for the Write@UNG series included six workshops. This series will continue in 2017-2018. Stay in touch with CTLL to learn more about next year’s offerings! This opening session featured discussions about structure and accountability at the beginning of the academic year. Dr. Tara Gray, the Director of the Teaching Academy at New Mexico State, found this formula for writing productivity: 30 minutes a day for 4.5 days a week=180 pages of revised writing annually. Writing productivity comes down to structure and accountability. 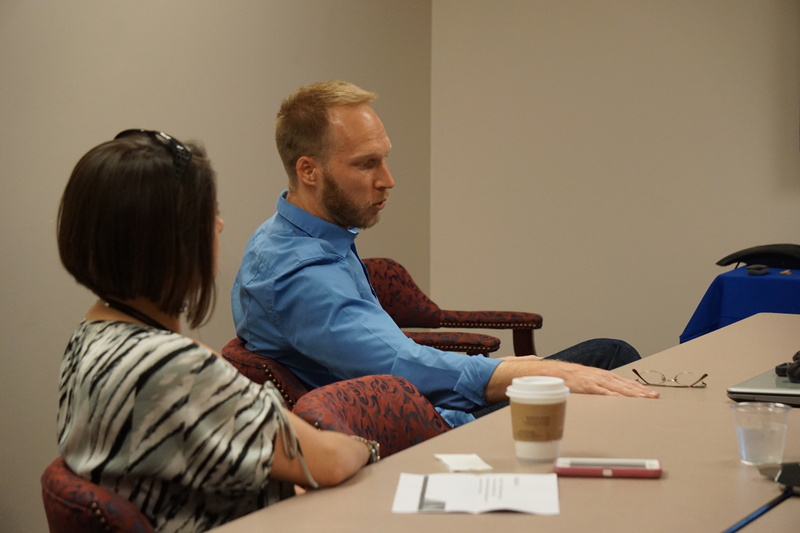 Dr. Steven Lloyd, Department Head of Psychological Science, and Dr. Ryan Shanks, Professor of Biology, joined the workshop talking about co-authoring: how and why. Attendees left the workshop with a stronger sense of the role co-authoring, even the non-writing co-author, can play in academic disciplines and scholarship. In this workshop, participants shared concrete advice about journal authoring from their experiences and the scholarly literature. Professors don’t need to start from scratch; rather, most faculty have materials for a first draft. Few subjects are more opaque but vitally important than intellectual property—especially in the increasing digital age in which we live, teach, and write. The Framers of the Constitution granted Congress the ability to secure “for Authors and Inventors the exclusive Right to their Respective Writings and Discoveries.” Amy Beard and Corey Parson, both with the UNG Press, joined the workshop to consider what is needed to know about intellectual property for writing and what “Writings and Discoveries” mean in your field. When preparing a manuscript for publication, we are faced with at least two kinds of revision: inward and outward. In other words, some of our revision is spurred by our reading closely and making our own changes. Other kinds of revision are spurred by reader feedback. Both are tough reflective activities but are central to scholarly productivity. Both Michael Rifenburg and Diana Edelman presented at the Creating Writing Groups workshop. Dr. Diana Edelman, Associate Professor of English, talked about the faculty writing group she founded. WriteIn members met weekly to write, share drafts, drink coffee, and experience the joys and frustrations of being a scholarly writer.